As startup and emerging growth companies prepare for the future, understanding the implications of new and changing accounting standards helps to ensure IPO readiness. Accounting Standards Codification (ASC) 842 transformed many aspects of how leases are accounted for in accordance with GAAP. 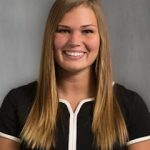 Per Accounting Standards Update (ASU) 2016-02, the Financial Accounting Standards Board (FASB) chose to update the prior leasing standard, ASC 840, to “increase transparency and comparability among organizations.” ASC 842 seeks to provide more relevant information about the implications of leasing assets that will be more visible to the preparers and users of the financial statements. This article will discuss how to properly account for a lease under ASC 842 from the lessee’s perspective. The conclusion will include transition guidance including a practical illustrative example. Note the comparisons to ASC 840 throughout the article; much of the common knowledge from ASC 840 can be leveraged in working through the complexities of ASC 842. If you determine an arrangement contains a lease, the lease must be properly recognized on your financial statements in accordance with ASC 842. When accounting for arrangements containing a lease, you must take the following steps. Similar to ASC 840, the accounting treatment for leases varies with the classification. The new leasing standard has two possible lease classifications for a lessee: a finance lease and an operating lease. 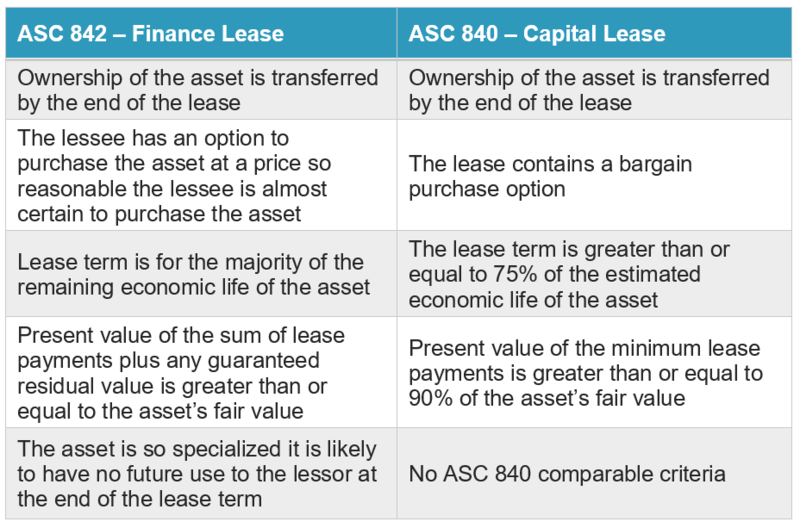 A finance lease is comparable to the capital lease classification in ASC 840, and the operating lease remains consistent between ASC 840 and ASC 842. The criteria for operating lease classification have not changed significantly; however, under ASC 842 the requirements for a finance lease classification are not as black and white as they were under ASC 840. 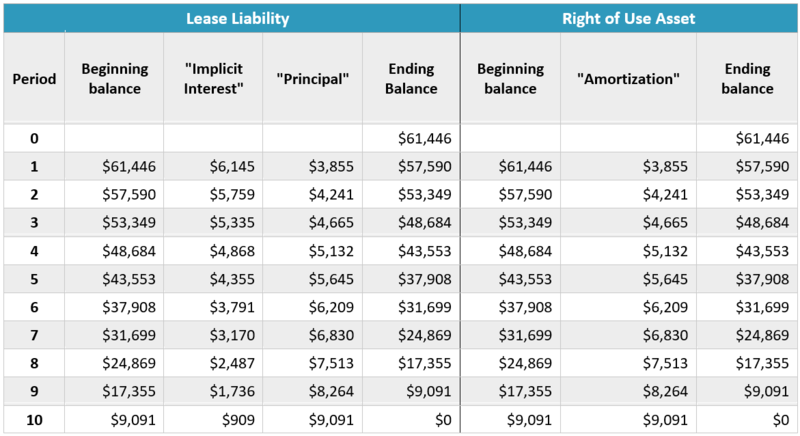 The table below lays out the criteria for a finance lease under ASC 842 and the comparable capital lease criteria under the old leasing standard. Note that a lease will be classified as a finance lease if any one of the criteria below are met. If none of the criteria in the ASC 842 column are met for a finance lease, then the lease is classified as an operating lease. Once the correct classification has been determined, the appropriate accounting treatment can be applied. Below is a high-level overview of how to correctly account for the two classifications of leases on the balance sheet, income statement, and statement of cash flows. The accounting treatment for a finance lease under ASC 842 does not greatly differ from a capital lease under ASC 840. Finance leases continue to be recognized on the balance sheet in the asset and liabilities section in a similar amount as was recognized under ASC 840. However, the existing capital lease asset and capital lease obligation should be reclassified as a right-of-use asset and corresponding lease liability. The amount recognized under ASC 842, while similar, may not be identical. For example, the discount rate used to calculate the capital lease asset and obligation may vary from the discount rate used to measure the right-of-use asset and lease liability. Like a capital lease, a finance lease continues to have an impact on the income statement as the lease liability and right-of-use asset balances are derecognized over time. The right-of-use asset is amortized straight-line over the shorter of the asset’s useful life or lease term. Interest expense is calculated using the effective interest method, which means that interest expense is based on the carrying value of the lease liability. The remainder of the lease payment is used to reduce the lease liability. 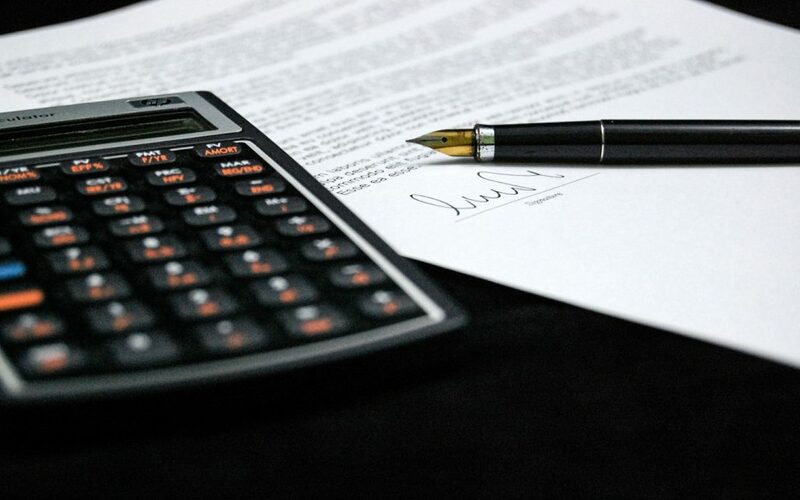 The lease payment will be apportioned to different sections on the statement of cash flows. The portion representing a reduction in the lease liability will be shown as an outflow in the financing section, whereas the portion representing interest expense will be shown as an outflow in the operating section. Under ASC 840, an operating lease lessee recognized straight-line rent expense over the lease term, net of any lease incentive provided by the lessor. The balance sheet impact was limited to prepaid or deferred rent for the difference between straight-line expense and cash payments and any lease incentive liability. Under ASC 842, operating leases affect the balance sheet by requiring capitalization of a right-of-use asset and corresponding lease liability. The lease liability should equal the present value of the remaining lease payments, including any probable lessee-guaranteed residual value. The right-of-use asset should equal the amount calculated for the lease liability adjusted for prepaid rent, asset impairment, remaining balances of any lease incentives received, and unamortized initial direct costs. Operating leases will have a similar income statement impact under ASC 842. The lease expense is computed as the total remaining lease payments, net of any lease incentives, plus any unamortized initial direct costs, divided by the lease term in order to achieve a consistent straight-line expense throughout the term of the lease. The lease liability reduction is the amount of straight-line expense not attributable to interest consistent with the calculation of the finance lease liability discussed above. The right-of-use asset is effectively reduced by an amount equal to the straight-line expense less the portion of the straight-line expense attributable to the interest on the lease liability for the period. Thus, a single straight-line lease expense equal to both the interest calculated on the lease liability and amortization on the right-of-use asset will be recorded to the income statement each period. As with ASC 840, the cash payments for operating leases are recognized on the statement of cash flows as an operating activity outflow. Below is an example detailing the mechanics of the amortization of the right-of-use asset and the effective interest method used in calculating the reduction in the lease liability. Note how the payments of $10,000 each period and a discount rate of 10% reduce the lease liability, with a corresponding reduction in the right-of-use asset as it is recognized over time. According to ASC 842-20-50-1, “The objective of the disclosure requirements is to enable users of financial statements to assess the amount, timing, and uncertainty of cash flows arising from leases.” Disclosures are meant to enhance the financial statements by providing relevant information that users could not otherwise derive from the financial statements themselves. The disclosure requirement under ASC 842 includes a general description of the lease, information about any significant assumptions or judgements, information about the basis, terms and conditions on which the payments are made, a narrative disclosure about the bargain purchase or termination option, and any restrictions imposed by leases. The leasing standard is effective for public companies for fiscal years beginning after December 15, 2018, and for private companies for fiscal years beginning after December 15, 2019. However, there is an exception for emerging growth companies (EGC). EGC’s who have yet to implement GAAP will have the same effective date as private companies, even if they are publicly traded. The FASB has established two different methods for transitioning financial statements to reflect ASC 842. The first method allows companies to adjust financial statements to reflect ASC 842 in all periods presented on the financial statements. The second method, as described in ASU 2018-11, allows companies to forgo adjusting its comparative periods, and instead adjust the financial statements through one cumulative-effect adjustment to the beginning balance in retained earnings in the year of adoption. The FASB released the latter approach to provide a simplified way for companies to adjust financial statements. Each lease must be analyzed using the ASC 842 criteria to determine the correct lease classification. The majority of leases will remain as originally classified under ASC 840; however, in some rare cases, a lease could change classifications. For example, a lease that was classified as an operating lease under ASC 840 could be classified as a finance lease under ASC 842 if it meets one of the five finance lease criteria. Note that a classification change does not include capital leases that are re-classified as finance leases; that is a holistic change that all companies will implement. Once all leases are correctly classified using the ASC 842 criteria, each lease should be remeasured to properly reflect the effects of the corresponding right-of-use asset, lease liability, income statement and statement of cash flows. Please refer to the article Early Adoption of ASC 842 for more information on the effects of transitioning to ASC 842. Although no company was required to adopt the standard until 2019, a number of public companies have chosen to early adopt ASC 842. For example, Microsoft Corporation is an early adopter. Microsoft’s first 10-Q of 2018 states, “The standard will have a material impact on our consolidated balance sheets, but will not have a material impact on our consolidated income statements. The most significant impact will be the recognition of ROU assets and lease liabilities for operating leases, while our accounting for capital leases remains substantially unchanged.” On Microsoft’s previously reported balance sheet, adjustments were made to operating right-of-use assets and operating lease liabilities line items. The balances for both the asset and liability were increased from zero as previously reported. Companies should be aware of the impact this change in asset and liability recognition will have on their balance sheets. The new standard could alter financial ratios and balance sheet balances, which may be important in meeting certain debt covenants or asset requirements.